Formerly IATA Director, Operations, Capt Don Van Dyke, FRAeS served as Alternate to the ICAO Air Navigation Commission and represented 290 airlines on expert panels dealing with Operations, Airworthiness, Flight Crew Licensing and Training, Aeronautical Information Services, Meteorology, and Visual Aids. He managed IATA Committees on Flight Operations and Engineering & Maintenance and their 21 working groups and conducted Operational Quality Standards audits of new member airlines worldwide. Prior to joining IATA, Don was Head of Safety, British Airways-Comair where his novel approach to integrated risk management was instrumental in the airline acquiring the first British Airways franchise outside Europe. His early work with Sierra Research Corporation involved navigation, guidance and radar systems for the US Air Force and US Navy as well as the world's first commercial weather modification project. He later became Chairman of Dynamic Technology and CEO of Command Airways (South Africa) . He has authored over 100 publications, is a long-time contributor to Professional Pilot , and has lectured at numerous international events. He holds three patents. He is a Fellow of the Royal Aeronautical Society , a Senior Member of the American Institute of Aeronautics and Astronautics and a member of the University Aviation Association. Don earned his B.Sc with concentrations in management, organizational development and international aviation law from Embry-Riddle Aeronautical University and is completing his MBA. A veteran pilot, he has over 18000 hours with 16000 in command of jet and turboprop airliners and helicopters, flying as an instructor, check airman, type rating examiner, and technical pilot. Chief pilots, Directors of Operations, Airline Training Pilots, Approved Check Pilots, Civil Aviation Agency Inspectors, Procedure Designers, Airline Pilots, ATPL Candidates, Aerodrome Noise Abatement Specialists, Aircraft Buyers, Aircraft Fleet Managers, Candidate Flight Dispatchers and anyone for whom a knowledge of how effectively an aircraft meets design and performance requirements is imperative. This course fulfills NTSB recommendation A-08-41 (June 17, 2008) for training on the rationale for and criticality of conducting performance assessments before each take-off and landing, especially on contaminated runways. The objective is to understand factors affecting aeroplane performance during each phase of flight. Using a specimen Aeroplane Performance Manual, student will be able to determine expected aircraft performance in scenarios similar to those encountered during typical line operations. The course introduces the objectives and importance of jet performance procedures and identifies data sources. The course builds a learning foundation on knowledge of the international standard atmosphere, principles of aerodynamics, and six basic groups of aircraft limitations. 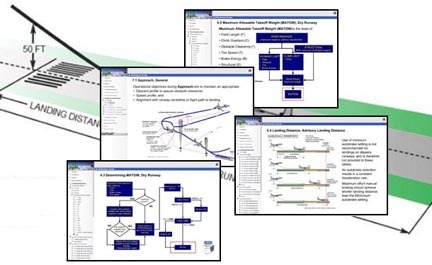 Each subsequent module discusses topics relating to a given flight phase. The eight associated review quizzes build student knowledge and confidence, driving the candidate from theory to real-life application. Course objectives are achieved when the student successfully completes the comprehensive Capstone exam. Certified Landing Distance, Advisory Landing Distance, Normal and Non-normal Config. Price includes all companion material and documents. Upon succesful completion of this on-line course, you will receive a certificate from the CQFA.